In describing A Parenthesis in Eternity, Goldsmith said, "In many classes I have touched upon mysticism to prepare our students for the unfoldment of the real meaning and function of the Infinite Way. Now, in the book, A Parenthesis in Eternity, my entire inner life is disclosed: my reason for living and my mission. The autobiography of my personal life would be boring: uneventful school days, routine business experience, and then out of the blue sky, a spiritual experience. This book is my spiritual life as many of you have seen it from the outside, but here explained from the inside." 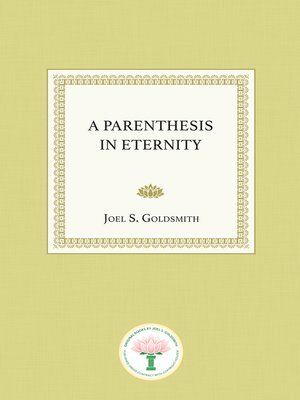 A Parenthesis in Eternity is a compelling, comprehensive presentation of the mystical journey that Goldsmith experienced. In Part 1, he lays out the principles that form the basis of mysticism, explaining that at its core is the truth that there is an inner, divine spiritual Self, a manifestation of God, which is our true identity. In Part 2, Goldsmith explains that as humans, we live in a "parenthesis" of the seeming boundaries of birth and death, as well as mental and material limitation. The purpose of the spiritual path, he says is to wipe out this parenthesis and bring us to the mystical experience of conscious union with God. With deep knowledge born of experience, Goldsmith describes the path we must travel to attain that goal, fully explaining the three stages, or "degrees" of spiritual unfoldment. In Part 3, Goldsmith elaborates on the nature and quality of the mystical life, emphasizing that this fourth dimensional consciousness is practical, for it is the secret of an harmonious, abundant life, free from fear and discord. All spiritual seekers will find A Parenthesis in Eternity to be an engaging, enlightening gift from one of the leading spiritual teachers of the 20th century.